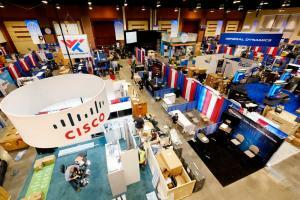 TechNet Augusta Military Trade Show Returns. The biggest names in military communications and electronic warfare will be rubbing shoulders downtown this week for TechNet Augusta 2016. The fourth annual trade show at the Augusta Marriott at the Con­ven­tion Center has exceeded the exhibit hall’s floor space, requiring organizers to put up outdoor exhibits in the surface parking lot at 10th and Reynolds streets. “It keeps growing every year,” said Barry White, the president of the Augusta Convention and Visitors Bureau. Registration for the event, which runs Tuesday through Thursday, could hit an all-time high of 3,000, which White said is a sign of the region’s growing prominence in military cyber affairs. TechNet grew out of the old Signal Sym­posium, which was last held in Au­gusta in 2005. TechNet was revived in 2013 by the Armed Forces Commu­nications and Electronics As­socia­tion, better known as AFCEA International. The organization was founded in Augusta in 1946, when the fort was known as Camp Gordon. In addition to providing key armed services personnel with a forum for discussing doctrine and best practices, TechNet provides an opportunity for military contractors to demonstrate new cyber technologies and services to government, industry and academic leaders. The event generates a $1.4 million economic impact, according to Augusta Convention and Visitors Bureau estimates. low cost of living, large health care sector and abundant recreational opportunities. Trade Show Executive magazine named TechNet one of its “Fastest 50” growing trade shows last year. White said he believes the event will only grow larger and possibly create spinoffs. “I think we’ll see more things like this coming in the future,” he said.